Hello there, I know it's awhile since anybody as been on here, but the pages aren't turning over so can't past page 4. Can anybody tell me if there is a photo of Neepsend War Memorial or one at St Mary's church Neepsend. Thanking you in advance, Roger Thompson. Back in the very early 1980's Lightwood Training centre was used as the finishing point for the Lorry Driver of the Year competition, I used to sign post it for the RAC. Hi there Chris, I have heard back from the GWF chap, due to him having only the basic rate it indicates he had under a years service and the closest he can get is very late August/ very early September. Sorry, the closest we can get. Cheers Roger. Good afternoon Chris, My pleasure entirely. Some times I get in front of myself as well(lol). What I have noticed is most of the KOYLI's records where destroyed in WW2. The people next door to use are doing heavy renovations so me and the wife have been out most of the day. As I said yesterday there is a way of working out the nearest possible date of him joining, there is a chap on the Great War Forum(GWF) who as studied it I will ask him if he can work it out for us, we know when he landed in France it's on his MIC. Cheers Roger. Hi there Chris, Attached is a copy of his entry in the Effects Register. There is a red stamped box entitled War Gratuity and it's possible to work out roughly when he joined up, looks like 1914 with having the Star. Cheers Roger. Hi Chris, I would have posted that article for you, but I thought you wanted to have a search for your self(lol). This Edwin is def your man, I checked census's birth and marriage certs and also the effects register states his things where to go to widow Clara. Cheers Roger. That's the one syrup, also the Sheffield Evening Telegraph from the day before. Cheers Roger. Hi Chris, No problem, if you don't find it let me know and I will copy it for you, in the mean time I am giving you a link to the Soldiers effects register. http://interactive.ancestry.co.uk/60506/42511_6129999_0042-00049/79747?backurl=%2f%2fsearch.ancestry.co.uk%2fcgi-bin%2fsse.dll%3fdb%3dUKArmyRegistersEffects%26gss%3dsfs28_ms_db%26new%3d1%26rank%3d1%26msT%3d1%26gsfn%3dEdwin%26gsfn_x%3d0%26gsln%3dHancock%26gsln_x%3d0%26msdpn__ftp%3dFrance%26msdpn%3d5087%26msdpn_PInfo%3d3-%7c0%7c1652381%7c0%7c5087%7c0%7c0%7c0%7c0%7c0%7c0%7c0%7c%26_F8007A65%3d3%2f2043%26_F00061C3%3dKOYLI%26MSAV%3d1%26uidh%3d524&ssrc=&backlabel=ReturnSearchResults Cheers Roger. Hi Chris, 9th April 1896, it was the spring 1/4 session assizes and reported in the Sheffield Evening Telegraph of that date, he also had to do hard labour as well. The Police where waiting for them, the article is under the heading of Caught in the act. Meanwhile I will keep looking for him in military records. 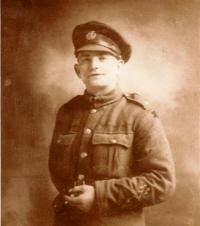 that avatar of mine is my granddad who survived the great War and served in Y&L Regiment. Cheers Roger. Hi there Chris, Yes it is in Find my past under British newspapers. he worked at where he robbed from he was led astray. Cheers Roger. Sorry I can't add anything Military to this post, but there is an entry for Wakefield Prison for a Edwin Hancock aged 18 in 1896 doing 6 months for warehouse breaking and stealing sheep's skins. He is aged 18 5' 61/2 in height with L Brown hair and looks like he is due for release 8th October 1896, register number 1863. Cheers Roger. Hi there Stuart, That is the one I was after again, thank you very much, I have 5 to cover at the moment I have traced all 5 but at the moment can only confirm 2 of them. I shall be down in the Sheffield area in about 3 weeks time to pick up on these women. Cheers Roger. Thank you for the welcome Richard, I have come across Dean on another Sheffield forum before, but was not aware of his sabatical. My immediate problem is that some where on this forum I have seen a topic that did show nurses, matrons and the like from Sheffield, as I'm assisting with a project to record the final resting place and memorials to the women who did war work in WW1 and in particular Yorkshire. Before I knew about my Sheffield roots whenever I was in Sheffied I had that feeling of being home, and I'm Batley born, bred and dragged up, funny ain't it. Cheers Roger. Hello there, I'm Roger and from Batley in the Old West Riding of Yorkshire. My family on the Paternal side came from the Handsworth area in the 1770's and they are very hard to trace up there. My interest is WW1 researching and at the moment looking for Rolls of Honour especially of the women that where involved in war work and thats how I came to find this site and what a godsend it is. Good work every body and if I am able to help at anytime I'm more than willing to. Cheers Roger.